Capital of the province of Noord-Holland, Haarlem lies between Amsterdam and the North Sea, just seven kilometers from the coast on the little River Spaarne, the source of the city's nickname, "Spaarnestad." This typical Dutch town lies on the northern boundary of the Bollenstreek, a famous bulb-growing region that produces tulips, hyacinths, crocuses, and daffodils. The city has a long history. From the 11th to 13th centuries, Haarlem was the seat of the Counts of Holland, and received its municipal charter in 1245, making it the second oldest city in the Dutch heartland. In the 17th century, the city was the scene of great artistic activity and the residence of many painters, including Frans Hals, Jacob van Ruisdael, Philips Wouwerman, and Adriaen van Ostade. This rich cultural heritage lives on to this day, and the Frans Hals Museum is one of the city's top tourist attractions. In the heart of the Grote Markt, Haarlem's main city square, Grote Kerk (St.-Bavokerk) is the city's most striking building. This Late Gothic cruciform basilica, now reaching 140 meters in length with its slender 40-meter tower, was started in the 14th century with the building of the choir, while the transepts were added in the mid-15th century. Interior highlights are its rich furnishings dating from before the Reformation, including the choir and lectern from 1499, the beautifully carved choir-stalls from 1512, and the brass choir screen from 1509. 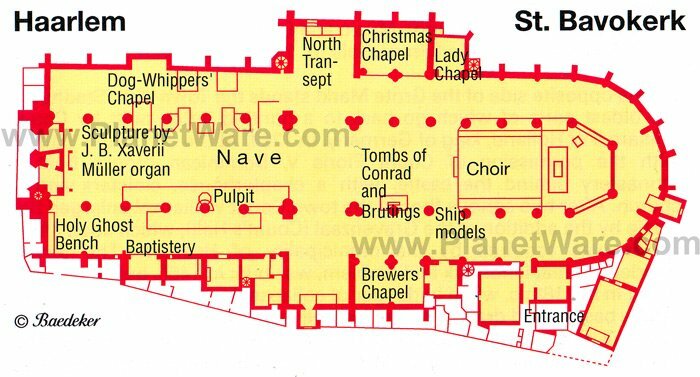 In front of the former chapel of the Seamen's Guild hang three models of Dutch warships, while the piers under the tower and in the choir are covered with 15th- and 16th-century paintings depicting symbols of the Apostles, the guilds, and church doctrine. The real star of the cathedral, however, is its famous Müller Organ, considered one of the greatest such instruments in the world for its tone and decoration. Built by Christian Müller in 1738, it has three manuals, 68 stops, and 5,000 pipes, the largest of which is 10 meters long with a diameter of 40 centimeters. Among those who have played the organ are Handel and Mozart. For an unforgettable experience, try to coincide your visit with one of the church's regular organ recitals. Established in 1913 in one of Haarlem's most important historic structures, the 17th-century Old Men's Almshouses (Oude Mannenhuis), the Frans Hals Museum is one of the leading art galleries in the Netherlands. The museum focuses on the work of the Haarlem Academy, a group of artists established by Frans Hals in the 1600s. The museum has the world's largest collection of works by Hals, including five of his large civic guard pieces. These large canvases display his genius for capturing a moment and bringing it to life in each of the faces. Other highlights include works related to the marksmen's guilds, companies of volunteers from the city's more prosperous citizens who would join together to form a civic militia. The collection also includes 17th-century portraits and landscapes, along with a collection of modern and contemporary art, including paintings, sculptures, textiles, ceramics, and graphic art by artists from Haarlem and the surrounding area. Standing opposite the Grote Kerk is the City Hall (Stadhuis), the oldest parts of which date back to 1250. More recent features, such as the external staircase, the north wing, and the Neoclassical façade, were added in the 1600s. The tower, Haarlem's greatest landmark and emblem, was rebuilt based on original plans in 1913 (the original bell still rings at the beginning of council meetings). The interior is also of interest and includes numerous fine paintings, relics, and mementos, along with fine woodcarvings (guided tours are available). The oldest museum in the Netherlands, Teylers Museum was founded in 1778 after its namesake, a wealthy cloth and silk dealer, bequeathed his fortune to build an establishment to illustrate the development of art and science. One of only four such museums in Europe - its contemporaries are in Oxford, London, and Paris - the museum includes an extensive art collection, with numerous drawings and pictures by early Dutch masters. Other important works include figure studies for the Sistine Chapel by Michelangelo, drawings by Raphael, and an outstanding collection of scientific instruments, minerals, and fossils. Of particular interest is the exquisite Oval Room, designed as a place for research and study and where scientific experiments were once conducted. English language guided tours are available. Also of interest is the adjoining Weigh House (Waag), erected in 1598 and in use until 1915. One of the most picturesque corners of Haarlem lies around the Bakenessergracht, home to some of the city's oldest and most spectacular buildings. Especially pretty is Hofje van Bakenes, a lovely little courtyard dating from 1395 that's famous for its cryptic rhyme (look for the plaque above the entrance). At the end of the Bakenessergracht is the River Binnen Spaarne, crossed here via an attractive old drawbridge, and from which you get a great view of the Amsterdamse Poort, Haarlem's only surviving city gate. Built in the early 1400s and a national monument, it's flanked by two octagonal towers and two round towers, as well as remnants of the old city walls. In Grote Houtstraat, Proveniershuis is a collection of fine old buildings dating from the 17th and 18th centuries that once housed a cross-section of city folk, from nuns and priests to merchants and retired guildsmen. Today, it's a splendid area to stroll around as you soak up the atmosphere and explore the side streets that peel off into the city's many quiet nooks and crannies, including to the numerous old almshouses where the poorer citizens once lived. In addition to being the location of many of the city's main tourist attractions - including the Town Hall and Grote Kerk - Haarlem's Grote Markt is home to a number of other splendid sights, and a visit here is one of the most popular things to do. Highlights include the Brinkmann-Passage, with its shops and restaurants, and the old Guard House (Hoofdwacht), one of the oldest buildings in Haarlem and notable for its gable from 1650. But the real gem here is the Vleeshal, or Meat Hall. Built in 1603 to house both the municipal slaughterhouse and the butchers' guild, it ranks as the finest work of the Northern Renaissance movement and has been perfectly preserved as an annex of the Frans Hals Museum. Also of note is the Vishal, or Fish Hall (also occupied by the Frans Hals Museum), notable for its red and white façade topped by beautiful ornamental gables. You can learn more about this charming neighborhood and its history on a two-hour Private Walking Tour with a local guide. The Roman Catholic Cathedral of St. Bavo is a relatively recent three-aisle cruciform basilica built between 1895 and 1906. Some 100 meters long, 42 meters wide, and 60 meters high, it's a good example of the transition in church architecture from traditional to more modern designs. Highlights include the Cathedral Treasury with its valuable silver liturgical utensils and a reliquary with the remains of St. Bavo. Other notable features are the fine stained glass, as well as sculptures and paintings by well-known Dutch artists. Also of note is the Willibrord Organ, built in 1923 with four manuals and 75 stops (check the schedule for periodic organ recitals). Haarlem's New Church (Nieuwe Kerk) was built between 1645 and 1649, with a graceful Renaissance tower and clock dating from 1795. Inside the church, be sure to notice the magnificent Baroque tomb of William of Orange, made by Hendrick and Pieter de Keyser in 1614. Also of importance in the adjoining churchyard are the graves of painters Jacob van Ruisdael and Philips Wouwerman. Although one of the city's smallest attractions, the Corrie ten Boom Museum is well worth a stop when visiting Haarlem. Dedicated to the life of author Corrie Ten Boom, it's reminiscent of the Anne Frank House in Amsterdam and portrays a typical small home that played an important role in hiding persecuted Jews during WWII. The focus of the museum - located in the shop her family owned - is Ten Boom's bestselling book, The Hiding Place, which vividly portrays the dangers involved in providing a safe haven for refugees (tragically, the family were found out and most were killed before the end of the war). English language guided tours are available. Standing on the banks of the river Spaarne, the De Adriaan windmill is a faithful replica of the original 1778 mill built on the foundations of an ancient defensive tower. The original, which ground tufa to a powder used in cement making and was later used to grind tobacco and then corn, burned in 1932. On a 45-minute tour, you can learn more about the mill's - and Haarlem's - history and see how a windmill operates. From the viewing platform, you can enjoy good views of the river and city. Carlton Square Hotel: 4-star hotel, across from a park, stylish design, spacious rooms, underground parking. Hotel Lion D'or: mid-range pricing, near the train and bus station, contemporary decor, friendly staff. Amrath Grand Hotel Frans Hals: affordable rates, fantastic location, wonderful service, spiral staircase, well-appointed rooms. Ambassador City Centre Hotel: budget-friendly rates, central location, modern rooms, lobby filled with antique clocks. Haarlem sits near the North Sea, not far west of the Netherlands capital of Amsterdam. 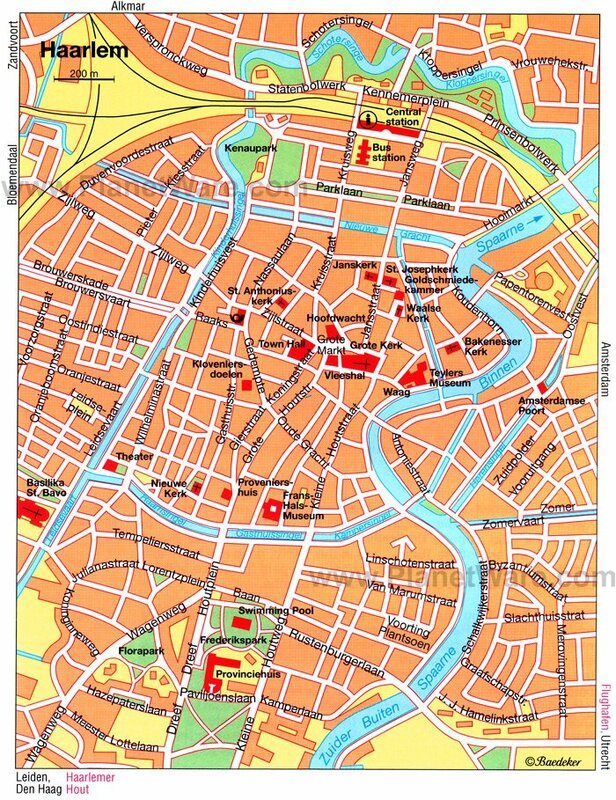 To the south, the cities of Leiden, The Hague, and Rotterdam are close together. Just north of Rotterdam is the porcelain center of Delft, and southeast of Rotterdam is Eindhoven, filled with art museums and historic buildings. Closer to Haarlem, to its southeast, is the country's fourth largest city, Utrecht, and beyond it, Arnhem stands on the banks of the Rhine River. North of Arnhem is the Hoge Veluwe National Park, with the outstanding Kröller-Müller Museum's collection of works by Vincent Van Gogh.